People Think He Looks Angry, But If You Keep Watching… This Cat Is The ‘Coolest’ Cat EVER! Most cats should never be shaved, but summer heat can be TOO much for some breeds of cats with extra thick hair which was designed for cold temperatures! We DON’T recommend shaving your cat, but this cat was shaved to save him from the extreme summer hear. The results? You’ve gotta see it! This cat is actually VERY thankful this summer won’t be SOO unbearable for him, but luckily he doesn’t know how he looks, because he sure does look angry! I’m speechless…I don’t even know what to say? !—SHARE this story with your friends! P.S. We don’t recommend shaving any cat unless your your vet has deemed your cat must have this done to prevent undue heat. Also make sure you keep your cats inside in a cool environment! 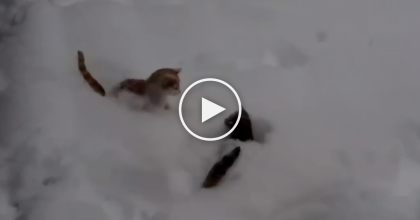 They Decided To Let The Cats Out To Play In The Snow, But They Were In For A Surprise… Watch This! 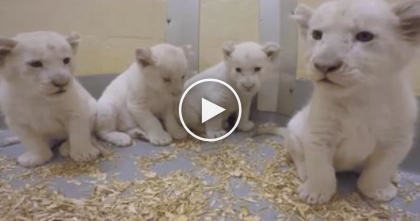 Rare White Lion Cubs Are Only 8-Weeks Old…And Cuter Than Ever, Just Watch! 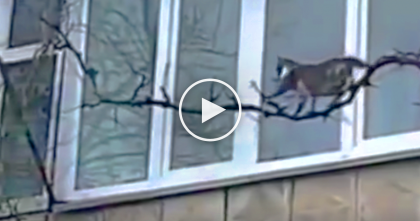 VIDEO: Cat Starts Climbing A Tree, But If You Keep Watching…The Results Are Shocking, Omg! 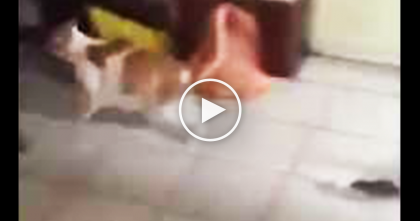 I Thought The Cat Was Chasing The Mouse, But When The Camera Zooms In… OMG, What?! Cute Little Kitten With Adorable Paws Will Melt Your Heart When You See Him… This Is SOO cute! !